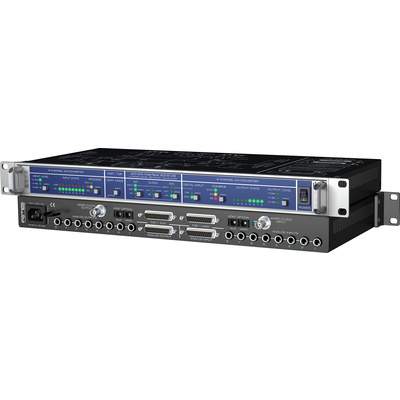 Product #3345 | SKU RME-ADI 8 DS Broadcast | 0.0 (no ratings yet) Thanks for your rating! The ADI-8 DS Broadcast from RME is an eight-channel, analog-to-digital (A/D) and digital-to-analog (D/A) converter, housed in a single space, rack-mount enclosure. It utilizes 24-bit converters using 128x over-sampling, and operates at sampling frequencies up to 96KHz on its internal clock. Apart from conversion, the unit also functions as a digital format converter or distribution device to ADAT and TDIF based equipment. The input signal path to the A/D converter is totally balanced. Each analog input has a "Signal Ok" and "Over" LED, so levels and overload are easy to check, allowing the user to maintain full dynamic range. Front panel switches select the unit's operating levels. The ADI-8 DS Broadcast provides an additional 6dB of input and output gain required for broadcast applications. The converter functions at internal sample rates of 44.1, 48, 88.2 and 96KHz, while RME's Intelligent Clock Control technology (ICC) enables flexible operation with the internal clock, external word clock or the digital input signals. The unit also provides Sample Split on the ADAT connectors which is S/MUX compatible and provides the ability to transmit higher sample rates using the ADAT optical protocol. The digital section of the unit includes two other functions. Bit Split allows the user to split a single 24-bit signal into two 16-bit outputs, while Bit Combine will put the split signals back to the original full 24-bit signal. Copy Mode routes the digital input to both the ADAT and TDIF digital outputs.